Explanation: Place your cursor on this stunning view through dark skies over western Australia to highlight wonders of the southern Milky Way -- including the famous Southern Cross, the dark Coal Sack Nebula, and bright reddish emission regions surrounding massive star Eta Carinae. Recorded Tuesday at about 2 am, the thirty minute long color film exposure also captured a bright but mysterious object that moved slowly across the sky for over an hour. 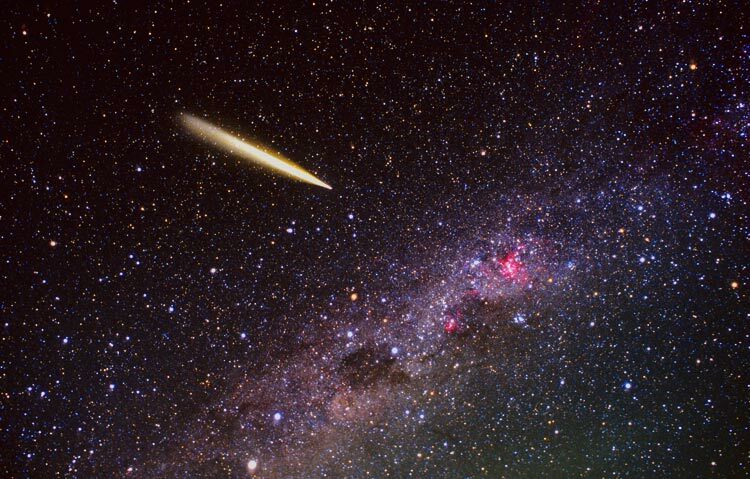 Widely seen, the object began as a small point and expanded as it tracked toward the North (left), resulting in a comet-like appearance in this picture. What was it? Reports are now identifying the mystery glow with a plume from the explosion of a malfunctioned Russian rocket stage partially filled with fuel. The rocket stage was marooned in Earth orbit after a failed communication satellite launch almost a year ago on February 28, 2006. A substantial amount of debris from the breakup can be tracked.